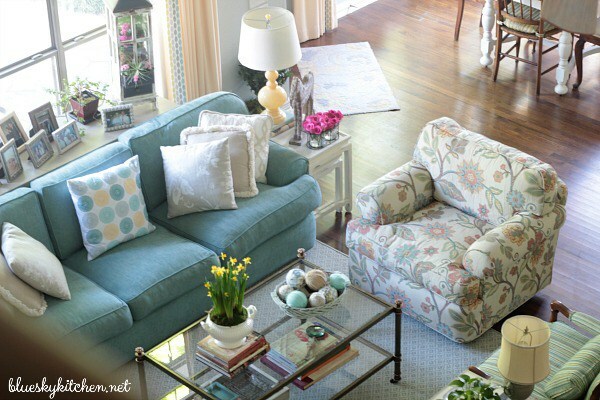 Welcome to July and Welcome to the First Friday Home Tour feature for this month. Today we are welcoming Carol from Bluesky at Home. I've had the pleasure of being in her home for a cooking class and it is stunning! I know you'll enjoy this home tour. Carol is going to do the talking to tell you about her home. I am so excited to share a tour of a few rooms from our home today with you at Poofing the Pillows. Stacey is one of my favorite Lone Star Sisters and I was thrilled when she asked me to participate in this month’s home tour feature. Let’s start with my favorite room in the house ~ my kitchen. This is where I spend the majority of my day: cooking, writing, testing recipes, even painting and DIY takes place here. I spent most of my efforts and time planning this room. Our kitchen and living room are basically one big area ~ we definitely have an open concept. I love the colors and arrangement. I’m never out of the action when I’m in the kitchen. 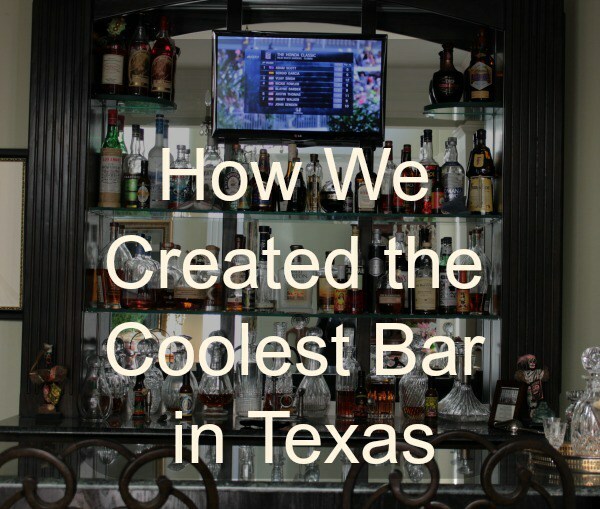 Sweet Shark’s favorite room is his bar ~ which I describe as the coolest bar in Texas. It’s not a man cave, but he spends time in there relaxing, reading and watching golf. Our bedroom is a soothing area with a beautiful view of the backyard and pool. The colors from the rest of the house continue in here. I love our master bathroom. it was also a room that we gutted during the remodel. The lighting and the bathtub (which unfortunately, I don’t use enough.) are my favorite things about it. I hope you enjoy touring our favorite rooms and the remodeling we did. I loved every bit of this process and I still love adding accessories, moving things and around and just living here. Be sure to visit her at Blue Sky at Home. Absolutely gorgeous, love the light! Hope your fourth is full of lots of family fun and laughter!! Love your beautiful home! I have a double slipper tub in our master bath and just love it, it was my gift to me after fifteen months of renovation lol. I definitely use it more in the winter then the summer though! What a lovely home! Heading over to see more on her blog! Absolutely lovely home! My favorite room is the kitchen, so bright and welcoming! I could see myself spending a lot of time there too! Thanks Stacey for featuring our home on your First Friday Home Tour. Excited to share. Carol's home is just beautiful. I would find time for that tub! I love Carol's home! The colors are so soft and pretty. And her kitchen is absolutely dreamy! Have a wonderful weekend and a happy 4th of July! Carol's home is beautiful. I love the openness and the colors. Thanks for sharing it with us Stacey! Happy Fourth! I look forward to these first of the month home tours and Carol's home is lovely. The soft colors are beautiful. What a gorgeous kitchen she has! The colors are both soothing and relaxing. I'll have to hop over and follow her. Awesome that she is a chef too! Thanks for sharing with SYC. Such a lovely home and such a great chef too! So beautiful and peaceful looking! She has the perfect kitchen that she needs for all her cooking. Love all the blue and white. Just beautiful! I love her tub. Thanks for sharing. Sooo beautiful. Love that kitchen. Love the colors! So light and airy. A beautiful home to start the tour off! That kitchen ... the tub ... thanks for sharing this with us! Hi Stacey, such a nice feature from Carol showcasing her lovely home. Just stunning. Lovely home. Thanks for the tour! Yes, my Mr. living's got a counter bar type and loves it. We had one in every home we owned, even in the farm we had, lol! He has fun serving drinks for his friends. I love this home, it's gorgeous and that tub is got all of us envious in blogland. Love the open space concept too, although I don't have it. Thanks for sharing Carol's home with us. Thanks for your sweet visit too. Beautiful home and the recipes have me intrigued! Off to visit Carol's blog. Is this a new series...not sure if I've seen it before on your blog. I'm loving your featured home tours on the first Fridays of the month. Carol's house is just beautiful and inviting. What a great tour of a beautiful home! Thanks for sharing! Oh my goodness that kitchen is absolutely breathtaking. The rest of the house is not too shabby either. You have a gorgeous home! 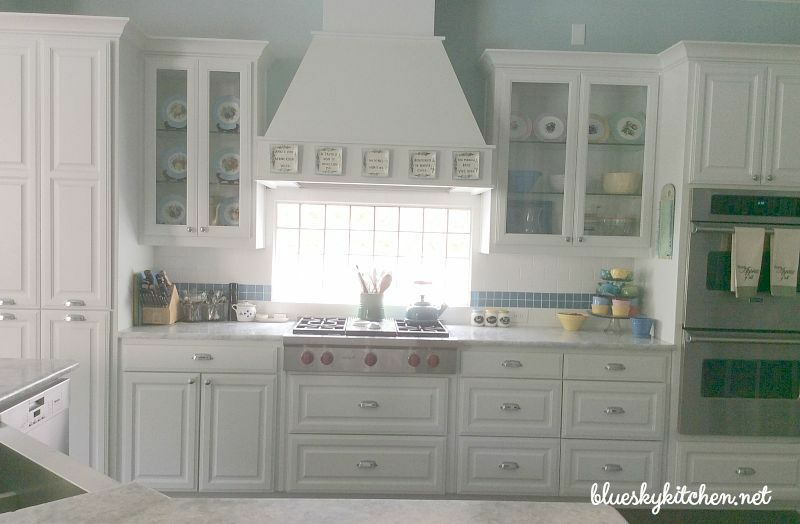 I love the shade of blue in your home and your beautiful kitchen. 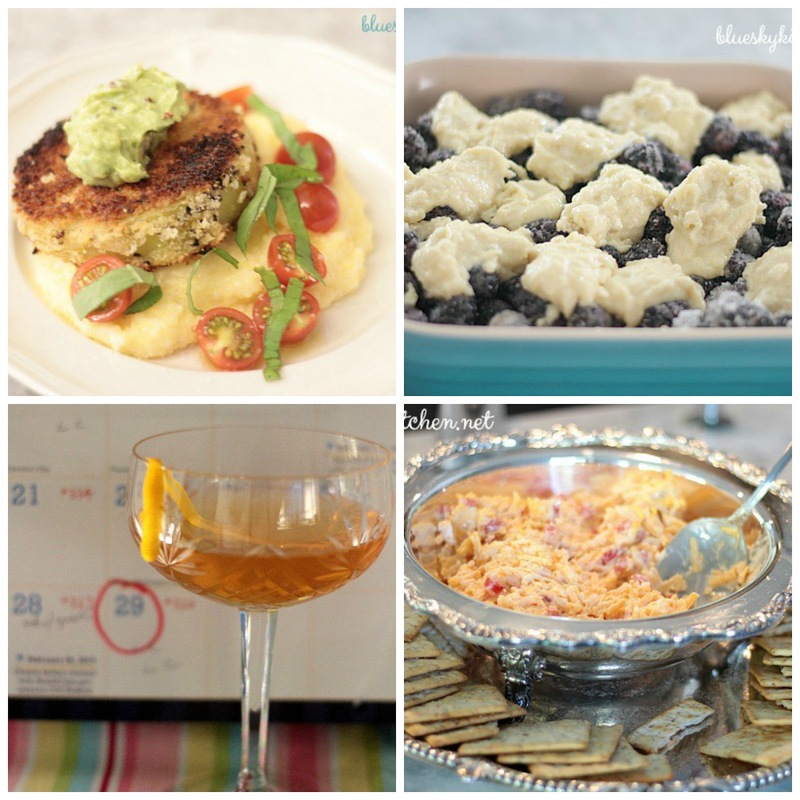 Thank you for linking up at Dishing it & Digging it link party. We love having you. What a gorgeous home! I'm off to check out Carol's blog and drool over some of those recipes!! 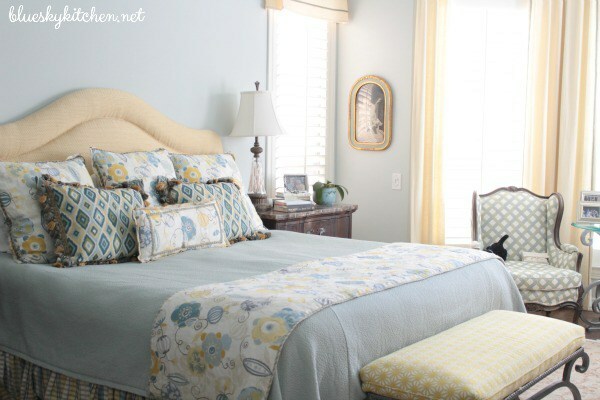 I am getting a serious crush on the soft color palette and the blue tones! Your house looks gorgeous! !Great tour!! Thank you for sharing with us at #HomeMattersParty . We would love to have you again this week. Carol's home is so pretty it's soft, warm colors. Since I take a bath every night, I'd definitely love that pretty bathtub. tacey Carol's home is so beautiful. I really like the use of those soft blues throughout the house. I love all that pretty, soft blue. Everything is just perfect! Hope you had a terrific holiday! What a lovely and inviting home you have created. Looking forward to following along, and reading some of those delicious recipes. Truly a beautiful kitchen! I too would spend all my time in that lovely space. It's unusual to see a window over the range, but I LOVE it!! I need to keep that in mind for the future. Thanks Stacey for sharing this gorgeous home tour!! Carol's home is beautiful....love, love her kitchen and the recipes looks amazing! A very lovely home and yummy looking recipes. 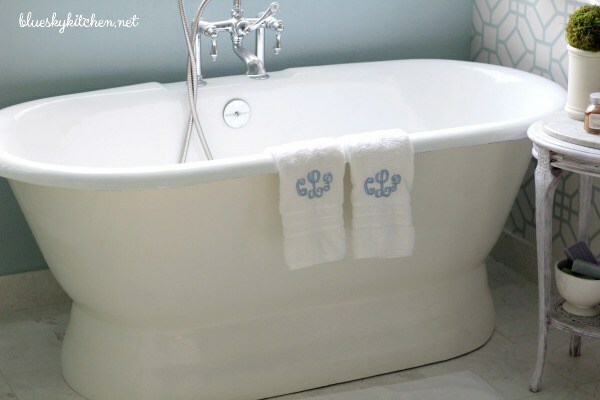 Love this home tour, Carol has such a gorgeous bathroom! I love bathroom they are my favorite. Carol has such a beautiful home! Love how peaceful and serene it looks.